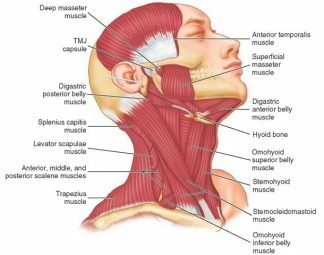 It is important point to note that the lower jaw (the mandible) is essentially held in a muscle sling that is hanging off the skull. The muscle themselves are found in the neck, cheeks and on the skull and mandible. 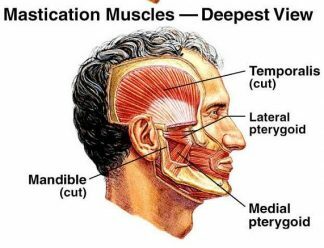 The muscles of chewing or mastication are part of an organ known as the masticatory organ that involves the jaw joint, teeth, gums and bone and the masticatory muscles. They derive in the embryo for the same material that other organs of the body come from. The teeth’s ligament has pressure sensors that send messages to the brain. This is known as sensory information. The brain then knows what each tooth is doing and assesses what is being eaten. It then feeds information to the muscles of mastication to co-ordinate their movements and the forces they generate. Some muscle fibres are found attached to the padding in the jaw joint and can influence the jaw movements as well. The muscles work essentially by one muscle relaxing and another muscle contracting. So in the mouth the main muscle groups function are the opening and closing muscles. There are a third group of muscles found in the neck that support the jaw movements. Anterior and posterior belly of the Digastric Muscle (found running from the front of the mandible to the base of the skull) in co-ordination with the infrahyoid group of muscles (found in the neck). The masseter (within the cheek stretching from the cheek bone to the mandible). The temporalis (attached from the mandible to side of skull over the “temple” area). The medial pterygoid (attached from base of skull to inner surface of the mandible). The lateral pterygoid (attached from base of skull to one part of the muscle to the padding in the jaw joint and the other part to the mandible). Trapezius – from the back of the base of the skull to the shoulder. Sternocleidomastoid – from the back base of the skull to along the side of the neck to the collar bone. The closing muscles are stronger than the opening muscle, which becomes a problem when the closing muscles are overworked or irritated. It makes it difficult to open the mouth and can affect the jaw joint. This is called trismus. If the neck muscles are sore then jaw movements are also affected.